Senator Arthenia Joyner and Lawyers’ Committee President and Executive Director Barbara Arnwine. 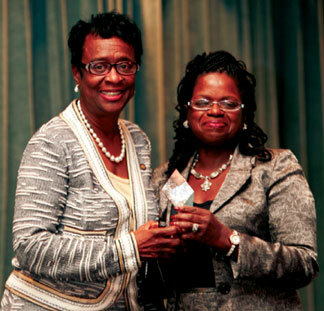 WASHINGTON, D.C. — The Lawyers’ Committee for Civil Rights Under Law recently honored Senator Arthenia L. Joyner (D-Tampa) with the 2013 Distinguished Civil Rights Advocate Award. The former president of the National Bar Association (NBA) received the prestigious award during a reception of the NBA’s 88th Annual Convention in Miami, Fla.
A private practice attorney for 44 years, longer than any other African American woman in Florida, Senator Joyner was the first female Black attorney in Hillsborough County, and will soon become the first African American woman leader of the Florida Senate Democratic Caucus. Senator Joyner also serves as counsel to Vanguard Attorneys, a personal injury law firm in Tampa. Senator Joyner is also an advocate for international justice and human rights. She was a leader in the movement to end apartheid in South Africa and was jailed for protesting against apartheid. Well-known as a champion for poor and disenfranchised persons, Senator Joyner has a well-founded reputation as a fearless, passionate, outspoken and effective legislator. Her long list of accomplishments includes legislation that would restrict the use of restraints on incarcerated women who are pregnant, in labor or postpartum and the expansion of early voting opportunities in Florida. Senator Joyner has consistently maintained an exceptional commitment to public service activities, including leadership roles in support of women’s rights, diversity and access to justice, and has received numerous local, state and national awards for her dedication. Since 2001, the Lawyers’ Committee – a non-partisan, non-profit formed in 1963 at the be-hest of President John F. Kennedy – has worked with the NBA to recognize those leaders who grant a voice to the un-heard and open a pathway to-wards expanded civil rights. Senator Joyner will now join such Distinguished Civil Rights Advocates Award honorees as Louisiana Supreme Court Justice Bernette Johnson; U.S. District Court Judge Thelton E. Henderson, CNN, Marc Morial, James Ferguson, Julius Chambers, Fred D. Gray, Dennis Archer, Judge Horace T. Ward, Congresswoman Maxine Water, Cathy Hughes, Trayvon Martin’s parents, Sabrina Fulton and Tracy Martin, and family attorneys Natalie Williams, Daryl Parks and Ben Crump.